Every once in a while, I try a new piece of technology that genuinely blows me away. The first time I strapped on an Oculus Rift; my first experience with a self-driving car. 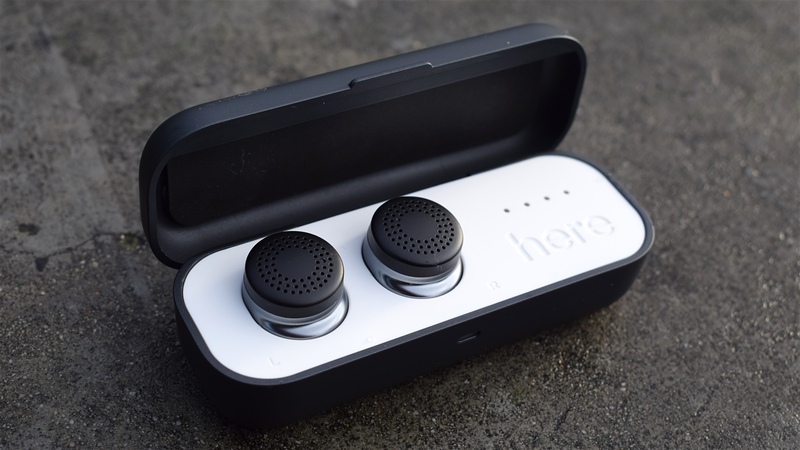 My debut outing with Doppler Labs' Here Ones earns a place on that list too. The Here Ones, an update to the Here Active Listening hearable we reviewed last year, are a pair of noise-cancelling smart earphones that manipulate and augment the way you hear the world. While we were impressed by Doppler's Here Active Listening, their big limitation was that they didn't play music - a real dealbreaker for many. The Here Ones change that with support for audio over Bluetooth, along with more useful ways to filter noise and the ability to let you interact with Siri and Google Now voice assistants. I've spent some time with the Here Ones plugged into my lugholes (and updated this review to reflect some recent updates). I've worn them in bustling streets, busy coffee shops and even on a plane. Doppler has found ways to make the Here Ones useful in a wide range of real-world scenarios, and my experience across many of them has left me duly impressed. There may still be some way to go, and the Here Ones aren't perfect, but I've never been more excited about where hearables are headed. Here's my review of Doppler's new buds. I'm walking down the road listening to music. I turn onto a particularly loud and busy street, so I whip out my phone and roll the Here Ones down to -22dB (the lowest you can go) which instantly suffocates the sound of traffic. I then enter a coffee shop and tap one of the earbuds to activate the bypass so I can hear the person serving me. I make my order, collect my coffee, then tap again to pick up the music where it was paused - all without removing the earbuds or drawing too many perplexed looks. The Here Ones are impressively small for what they do, aping the design of the Here Active Listening buds and coming in just a tad smaller than the Bragi Dash. They're sleek and snug enough that you might not immediately notice them if you were to look face-on at someone wearing them. I seem to be in the minority of people not bothered by the design of Apple's AirPods, but those of you who do find the tiny toothbrush look off-putting will prefer the rounded shape of the Here Ones. They look like a generic pair of wireless earphones, and that's perfectly OK.
Doppler refers to the Here Ones as "in-ear computers" due to all the processing taking place inside, which makes the weight and size all the more remarkable. Each earbud is circular with a grille that lets the microphones "hear" the outside world, letting you make calls and speak to Siri/Google Now. Also included in the box are five extra pairs of different shaped tips, so I'd recommend trying them all out to find which fit most comfortably before you start using the Here Ones, as without a perfect seal the earbuds won't work to their full effect. The Here Ones come in a charging case – again, identical to the one we got with the Here Active – that resembles a contact lens box, with a small light on the front that shines orange when the Ones are charging. I'm getting on a plane. The moment I find my seat I pop my Here Ones in and hit the Airplane filter in the app. The world is suddenly drowned out and I'm back in my sound bubble. Then they start doing the safety demonstration, and in the interest of not maybe dying, I reduce the noise cancellation to let outside sound in without stopping my music. When they're done with the demonstration, I bring the sound back down again, and as we take off the raucous noise of the plane escaping the tarmac is mostly deafened by the noise cancellation and music. It's times like this where the Here One come into their own. The Here Ones are comprised of two main elements: real-world sound and streamed audio. These can be used simultaneously but it's only the real-world bits that you can play with. Doppler has made it easy to do this with a handful of pre-set filters that help you get the best listening experience in certain situations. These include 'City', which reduces wind and street noise; 'Crowd' which fades out background chatter; and the aforementioned Airplane filter. The good news is that Doppler is taking the music aspect seriously too, and has produced a really good pair of completely wireless earphones for listening to your tunes. I've switched over from my trusty Sennheiser in-ears, and the sound is just as warm and full with enough bass for my liking. Audiophiles may grumble at elements, but overall I think Doppler has done a good job here. Of course, where the Here Ones outshine many other wireless earphones, including the AirPods, is in the quality noise cancellation. I like the AirPods but they leak a lot of sound, while the Bragi Dash Pro let ambient noise in but don't give you precise control over how much. The Here Ones give you both. Streamed audio is something you can't manipulate, but you can layer it with the noise of the outside world, and there are a fair few scenarios (beyond airline safety demonstrations) where this might be useful. Maybe you're cycling and want to listen to music but not block the sound of traffic. Perhaps you're at a baseball game and want to listen to live commentary in your ear but still hear the game and your friends sat next to you. Or maybe you're one of those people with the impressive ability to chat while listening to music. Hats off to you – I think you'll like this feature. Sound quality on calls wasn't amazing to begin with, but it's something Doppler is improving, and a recent update made the clarity better here. When using Siri the mic is at picking up words even in busy spots, although sometimes I had to raise my voice a little louder than I'd ideally like to when speaking to a robot in a public place. I'm sat in a cafe. Noise levels are peaking with the lunchtime rush so I stick in the Here Ones and enter my sound bubble. Then I tap on the 'Enhance Speech (Back)' filter and bring the volume back up. I can now clearly hear the people on the table behind me talking, but the rest of the room is much fainter. Without the earbuds I can only make out bits of conversation, but when they're in my ears the words are more distinct. I feel like a spy. And a tad creepy. Another day, I'm sat opposite a friend and try a filter that instead enhances sound from the front. At the tap of an icon his voice is more pronounced while the clatter around us is washed out, and I can more easily focus on what he's saying to me. The Restaurant filter meanwhile amplifies all voices nearby, which makes it better for situations where you're sat with more than one person. As I mentioned earlier, there are several preset filters to play with, but in its first major software update Doppler added what it calls 'smart suggest', which offers up ideas for filters to fit your environment. This is something that's going to require some time to get really useful - CEO Noah Kraft wants to get it smart by the holidays - as this is the first instance of Doppler applying machine learning. And it gets smarter over time. If I adjust the filters to a certain way every morning that I get to the office, then the Here One starts recommending this preset. It also crowdsources behavior to inform recommendations. For example, if it detects a lot of people in a particular restaurant are turning the sound down, the Here One will learn that it's a loud restaurant, and start suggesting the same for any users who visit there. I also tried it about the city, and while it doesn't have many recommendations yet (it will need more people to use it) I did get some filter suggestions, such as the bus filter when I was on a road with bus stops. Noah says one day Doppler would like to move this to a "proactive" mode that will be able to automatically shifts filters and even turns on your favorite podcasts. On top of that you also have the Live Mix setting, which switches off all filters and lets you mess around with the EQ to fine-tune a profile that suits your situation, or to simply isolate a specific sound. Chances are that a lot of people won't know what they're doing when they first open this bit of the app, but it's intuitively designed so that it's easy to work out, and you'll be able to hear the different frequencies move as you play with them. You can also add neat effects like echo, reverb, flange, fuzz and a bass boost. When you've found your perfect mix it sticks, even if you quit the app. Doppler has also added inputs into the earbuds themselves that mean you won't always have to reach for your phone. Taking out either bud will cause the music and/or sound filter to automatically pause, and it will resume when you reinsert them. This works great, though the tap feature is a little uneven. As I've mentioned in some of my examples here, tapping a finger on the earbuds lets you perform some quick functions that are particularly useful in moments where you need to filter in outside noise. One tap switches on the bypass that lets all sound through and pauses any music; another tap applies the filter again. Two taps will activate Siri or Google Assistant, which you can speak to through the mic. I've found this quite hit and miss, sometimes having to go for a second tap to get it to register, and it can be a little annoying. Battery life on the Here One is sadly one of the downsides, possibly the biggest of the hearable. A software update has extended it so you'll get 2 hours and 15 minutes if you're streaming and 3 hours if you're just using the real-world AR filters. Most of the time I've been using a combination of both, which means I've been around two hours before the voice tells me the battery is low. You'll get about three charges from the case, which is decent, and Doppler has sped this up in an update so you'll get to 50% in 15 minutes. All things considered though, overall battery life is still low, and outperformed by most rivals. So really use has to be episodic, and that might be fine for some people, but as the Here Ones rarely disconnect me from the outside world I find myself wanting to keep them in for much longer than the battery allows. Sadly, it stops the Here Ones from being my go-to earphones, as much as I want them to be. Over time I'm hoping Doppler finds a way to rebalance the power consumption (it's already started to) so we can squeeze a bit more life out of them. Another problem that occasionally arises – and one I've had with plenty of others – is the Bluetooth connection. It can get choppy, usually when I have my phone in my pocket. It's rarely been a problem, but there have been a couple of times where it's started stuttering and I've had to remedy it by switching which pocket my phone was in (even if it wasn't closer to the earbuds, moving its location seemed to kick the stream back into gear). Doppler has also sorted Android support. At launch, only the Samsung Galasy S6 and S7 phones were supported, but now so long as you're running Android 7.0 or later, you're good to go. The Here Ones are very impressive, but, like other hearables out there right now, they feel like just a teaser of something much bigger. I'm more excited to see where Doppler takes this product over the coming months and years, both through updates and (hopefully) more iterations. Doppler is working on a real-time translation feature, and although the company told me it has no timeframe for release, this could turn out to be the killer app. What makes this so special is that, unlike Bragi's, this is being done on the earbud. I even got to try out an early version at Doppler's San Francisco lab - and it works! It's a bit slow right now, and the conversation couldn't exactly be described as "smooth" but we did get some back-and-forth going, and most impressive was that it was all taking place on the earbud. Doppler's working on this at the moment and hopes to get an early version out by the year's end. In the more immediate future it's also going to be releasing more noise filters. If and when the AI elements start getting smarter, thing will get more interesting – Spike Jonze's Her is creeping closer and closer to reality. Noah said he believed the Here Ones had an episodic use case. Maybe you'd pop them in for a bus ride, take them out again when you get to work, then put them back in when you go for a midday run. Having used them for a while now, I actually feel differently. Being able to listen to music, block out unwanted noises and hear people when I choose to, there are few reasons for me to ever take these out of my ears. Yes, I feel a bit odd wearing them in a social situation when nobody else has anything in their ears, and that anxiety isn't going away until devices like this get more ubiquitous – but they will. In our last Wareable 50 list we placed hearables as our big bet for 2017. After spending time with the Here Ones, I am more confident than ever that we made the right choice. With Here One, the hearable has truly arrived. Sound quality is surprisingly good, the earbuds don't draw attention to themselves, the augmented audio features are awesome, and it's a nice way to interact with Siri et al. It's just a shame the battery lets them down, because chances are that when you pop these in, you'll have few other reasons to take them out again.